The BIG Power Worker forklift truck with its large wooden pallet and transport crate made from strong cardboard, is the ideal toy for providing young children with lots of fun whilst they're busy loading and unloading. The side handles allow the fork of the truck to be easily moved upwards and downwards and the lifting platform to be tilted sideways. 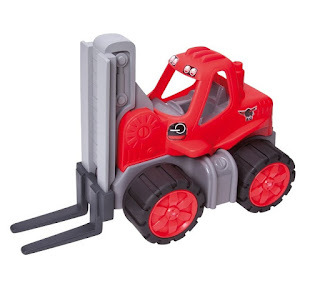 Young warehouse managers can therefore enjoy loading and unloading small transportable items onto vehicles or toy shelves.